The UNO MUFON SOCIETY, Omaha UFO Study Group, and the Nebraska Chapter of MUFON sponsor an Annual Symposium on the campus of the University of Nebraska at Omaha. The symposium is designed in keeping with the mission of the UNO MUFON SOCIETY: to look at the logical and rational scientific explanations of the UFO phenomenon. While preference is given to papers that address UFOlogy from a perspective using the scientific method of inquiry, all ideas and subject matter are welcome and will be considered. This web page serves as a request for papers to make a presentation (at your own expense) at our Annual Symposium. Please click on the 'contact' page on the sidebar to propose a presentation on a subject of your choice at our next symposium. Both Clubs received the University of Nebraska-Omaha Program of the Year 2011-12 award for our Paranormal Symposium. Our symposium was also mentioned in the Omaha World Herald. Click the link to read all about it. If you missed our 3rd Annual Paranormal Symposium or if you just want to relive all of the fun; click on the link below to download information from our Keynote Speaker, professor emeritus of Astronomy and Physics at the University of Nebraska - Omaha , Dr. Jack Kasher's presentation "A Case Study of an Abduction". We also have a PDF of all of the files and images that Dr. Kasher presented, here. 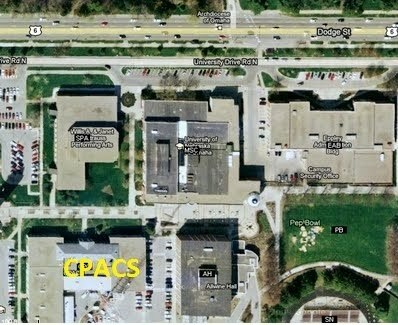 Come join us in 2013 at the College of Community Affairs and Public Service (CPACS) on the campus of the University of Nebraska Omaha for our UFO Symposium. Your paltry admission fee will gain you entrance to an all-day extravaganza of interesting, enlightening and entertaining presentations on topics related to UFOs and Extraterrestrial life. More than that, your admission fee will go directly to local research, investigation, scientific measurement equipment and technology to help us get to the bottom of the UFO phenomenon. Registration, networking. Meet Hosts and former guests from the UNO UFO Study Group's "Spooky Action at a Distance" Radio Show, and the UNO Paranormal Society's "On The Fringe" radio show. 12:00-1:00pm Provide your own lunch. The 2nd Annual UNO UFO Symposium was held on April 2nd, 2011 at the Milo Bail Student Center. Another great lineup of local and regional speakers made presentations on a variety of topics pertaining to abductions, evaluating UFO/ET claims, a revised history of UFOs in Nebraska and an update on Space Warp technology research. The event was covered by two local network television stations, regional newsprint and was featured on SIRIUS satellite radio's Howard Stern Show in "The News with Robin Quivers" segment on April 4, 2011. Click Here to listen to Howard goof on our Symposium. 3:20-5:00pm Keynote: UFOs are Real! On April 3, 2010 the UNO UFO Study Group, Omaha UFO Study Group, and the Nebraska Chapter of MUFON held its 1st Annual UFO Symposium at the Milo Bail Student Center on the campus of the University of Nebraska at Omaha. A superb lineup of local speakers submitted papers and made presentations on wide ranging topics.